Our loanees at Middlesbrough took part in a special tie at Anfield as they eventually lost 14-13 on penalties to Liverpool. Patrick Bamford had scored a late penalty in extra-time to take the tie to penalties but then missed the first in the shootout and it looked like Liverpool would go through. Jamal Blackman though made a save to enable Boro to level and then it carried on for 19 more shots as Bamford scored his second, Ken Omeruo scored his and even Blackman slotted himself. It was hard for them to lose but the exposure and confidence they will take from a close result like this should be invaluable. Over in Italy, Marco Van Ginkel played half an hour, but came off injured and Fernando Torres scored as AC Milan fought back to a 2-2 draw with Empoli. A controlled and professional run out for the best of the rest as progress was achieved with least stress against a willing and talented Bolton side. Petr Cech started in goal with the warmest reception since Didier’s return. His dignity and good sense in the last few weeks have not been overlooked. We started the match with control of possession and attempts. Andre Schürrle seemed determined to score as his header was cleared off the line and then a curled and powerful free-kick was tipped onto the bar by busy Bolton ’keeper Andrew Lonergan. We totalled 28 shots to their three but we were profligate and had to wait for Kurt Zouma, on his debut, to thrash the ball into the roof of the net as Bolton failed to clear a corner. 1-0. They were level a few minutes later as a rusty Petr Cech couldn’t reach the distinctive Matt Mills’ header. 1-1. Loic Remy, Schürrle, Salah and Oscar had all missed close range chances before Oscar finally and calmly pinged one into the bottom corner just as the second-half was taking hold. Bolton rarely threatened an equaliser and we saw out the match with some ease. Nathan Ake and Kurt Zouma will have enjoyed the night the most but the whole thing had a satisfying feel. The draw threw up a new and slightly interesting one – Shrewsbury Town away. Hands up anyone who remembers out last trip to Shropshire. Well okay it was a 0-4 drubbing with a couple from Gianfranco in the cup about ten years ago, the last league game was back in 1989. With so long between games the stiffs needed a run out and Burnley were kind enough to oblige. We handed them a 0-2 lead before goals from Jordan Houghton, Casey Palmer and Todd Kane saw us home. Diego Costa marches on and the Chelsea crowd rub their eyes in wonder. He is not yet fully fit, not yet speaking English, not really settled but he is ripping apart Premiership defences. The match started with a flourish as Willian burrowed into the Villa defence and flicked the rebound from his own shot square to Oscar who scuffed home. 1-0. Villa had been set up to hold their defensive shape and hit on the break but a goal down so early exposed their lack of another plan of attack. They remained strong at the back and Costa looked frustrated as his header flashed too close to Guzan who saved. Costa had to wait until the hour to plant a powerful header in from Fábregas’s cross. 2-0. Clearly enjoying himself Costa then dribbled through the tight spaces and his shot deflected to Willian to complete the scoring. 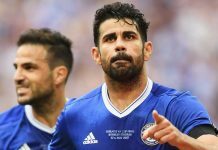 Diego Costa will have harder times at Stamford Bridge, there will be droughts and injuries but the thunderous reception he got from an appreciative crowd on his late substitution should help him through them. This was our first clean sheet since August. Jose will be particularly happy about that. A draw, secured by Izzy Brown’s goal ten minutes before the break, was a good result for Leicester who sit bottom of the table. Miro Muheim is making a name for himself – his parents certainly gave him a head star – but it was Tammy Abraham’s hat-trick that secured the points and the good start to the season for Joe Edwards’ young team.